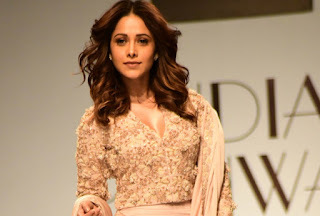 The beautiful actress of B'town industry Nushrat Bharucha sizzled the ramp for designer Kavita Aggarwal and look beautiful in designer’s outfit for the 10th season of India Runway Fashion Week held in DLF place Saket, New Delhi. Kavita Aggarwal’s collection was Ode to Pietra Dura an ancient decorative art form, often referred to as 'paintings in stone', Pietra Dura was once fostered by kingdoms as far apart in time and location as Romans and Moghuls. Her bridal collection is a tribute to Pietra Dura's vivacity and a captivating look into the new application for this age-old art form. The embroidery in her ensembles is a replication of Pietra Dura motifs – not so much in technique as in aesthetics. 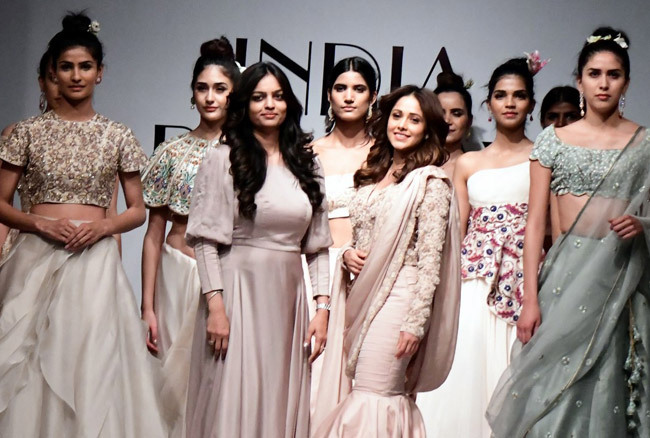 As crossover fashion doesn't merely adorn a wearer, it transforms her, she dedicates this Indo-western fusion to the modern Indian woman, who is rooted in traditions, yet open to fresh explorations.